Home » Binary Options Brokers » Broker Stockpair’s new platform! CySEC’s recent statement regarding binary options brokers’ platforms disturbed the whole market. After all improvements on the Spot Option Platform (just as, for instance, BDSwiss or optiontrade) this has been followed by several changes to the platform of the broker Top Option. In this article, however, we will explore the recent change that has occurred a few weeks ago. Change (improvement) of the Stockpair’s platform. We do not know whether the change was mainly due to the already changed CySEC statement, but surely, it had an influence. Let’s have a look at the changes that have taken place with a broker Stockpair. As we can see in the picture above, the platform maintains more or less the same view, there have only been slight changes to the layout. 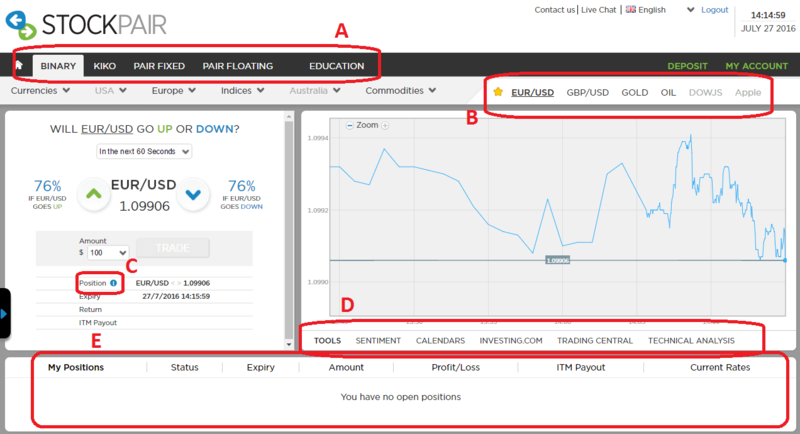 Currency movements graph has increased and shifted to the right side, the form itself to execute trades has shifted to the left side, open positions can be found on the bottom and much more has been added. A: You can see the type of options you are trading on the top, except classical binary options We can also choose Stockpair KIKO Binary Option or the pair options. B: On the right side, we can see our favorite assets so that we can open and trade as quickly as possible. C: If you hover your mouse on the question mark at the title position, you can find the current Bid and Ask price, and also the origin of the assets – this means that the platform itself has already incorporated the changes announced by the regulator. D: behind the button on this position there are different features that have so far not been offered by Stockpair. 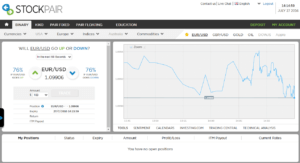 For example, you can now see an economic calendar, such as the one from Forex Factory.com. Technical Analysis button then shows us various indicators in the chart, on the broker’s website. Overall, I like that stockpair has decided to renew the platform after a long time. It looks like a simple version of the previously developed platform for advanced traders, which is probably the primary goal of stockpair. I have the impression as if they are slightly trying to imitate Trade Financials’ platform, which is offered, for example, by the broker 24Option. 24Option platform is quite similar.